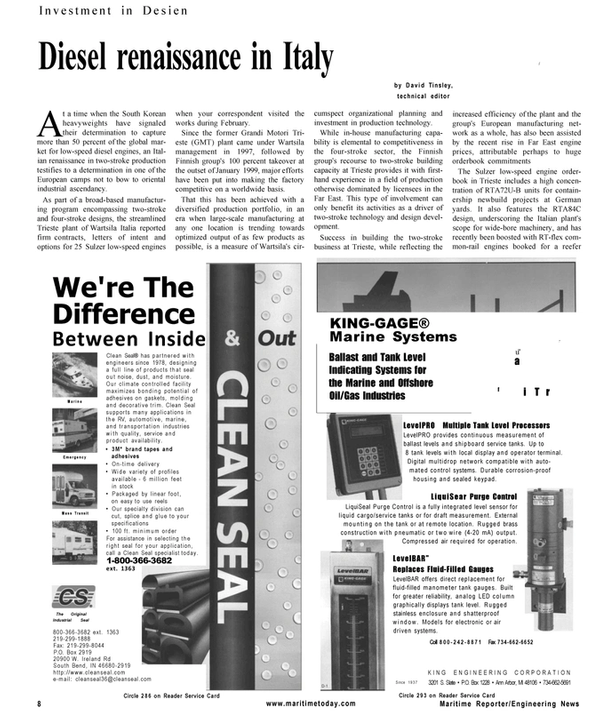 At a time when the South Korean heavyweights have signaled their determination to capture more than 50 percent of the global market for low-speed diesel engines, an Italian renaissance in two-stroke production testifies to a determination in one of the European camps not to bow to oriental industrial ascendancy. As part of a broad-based manufacturing program encompassing two-stroke and four-stroke designs, the streamlined Trieste plant of Wartsila Italia reported firm contracts, letters of intent and options for 25 Sulzer low-speed engines when your correspondent visited the works during February. Since the former Grandi Motori Trieste (GMT) plant came under Wartsila management in 1997, followed by Finnish group's 100 percent takeover at the outset of January 1999, major efforts have been put into making the factory competitive on a worldwide basis. That this has been achieved with a diversified production portfolio, in an era when large-scale manufacturing at any one location is trending towards optimized output of as few products as possible, is a measure of Wartsila's circumspect organizational planning and investment in production technology. While in-house manufacturing capability is elemental to competitiveness in the four-stroke sector, the Finnish group's recourse to two-stroke building capacity at Trieste provides it with firsthand experience in a field of production otherwise dominated by licensees in the Far East. This type of involvement can only benefit its activities as a driver of two-stroke technology and design development. Success in building the two-stroke business at Trieste, while reflecting the increased efficiency of the plant and the group's European manufacturing network as a whole, has also been assisted by the recent rise in Far East engine prices, attributable perhaps to huge orderbook commitments The Sulzer low-speed engine orderbook in Trieste includes a high concentration of RTA72U-B units for containership newbuild projects at German yards. It also features the RTA84C design, underscoring the Italian plant's scope for wide-bore machinery, and has recently been boosted with RT-flex common- rail engines booked for a reefer vessel series entrusted to a Portuguese shipbuilder. Trieste is currently operating at an output level in the region of 500-750 MW per annum, and is a showcase for the Wartsila Flexible Manufacturing System, the production model which has evolved out of the company's 'focused factory' concept. The Italian plant created something of the template for the new system, whereby nominated backup factories support each product-specific factory for engine assembly and component manufacture. Its role in meeting the surging demand for Wartsila 46 medium-speed engines, for which the Turku plant in Finland is the lead producer, is illustrative of the arrangements. The enduring popularity of the Sulzer ZA40S four-stroke series is clearly in evidence at Trieste, where it contributes substantially to the delivery program through to 2004. The Italian works is also the nominated factory for the Wartsila 26X, aimed at high-speed transportation and naval applications, and for the mighty 64-type four-stroke, the world's most powerful medium-speed diesel, delivering a staggering 2 MW per cylinder. Commencing with the 13,645-dwt German vessel Containerships VI, commissioned in 1999, a total 11 engines of the Wartsila 64 type have now been supplied for marine propulsion. At press time, the Finnish engine group was hoping that the design would be nominated for an Italian tanker newbuild project, to set a major new phase of diesel production in train at Trieste. While the largest modern-day diesel, which the plant is currently geared up to produce is the RTA84C in its eightcylinder configuration, the Italian factory has the distinction of having produced the world's biggest diesel engine as measured by bore size. The record was set in 1972 with the delivery of a Fiat two-stroke unit with a bore of 1,060-mm. By comparison, the largest, albeit considerably more powerful, engines now available are of 960 mm and 980 mm-bore, turned out in the Far East under license from Wartsila and MAN B&W, respectively.